Greetings and salutations, everyone; yes, once again it is I, Mani the fabulous, yet not extremely monstrously huge, purebred border collie, filling in for the guy I live with, and here to bring you the latest news from our garden. You may remember me from such posts as “The Blizzard”, among so many others. 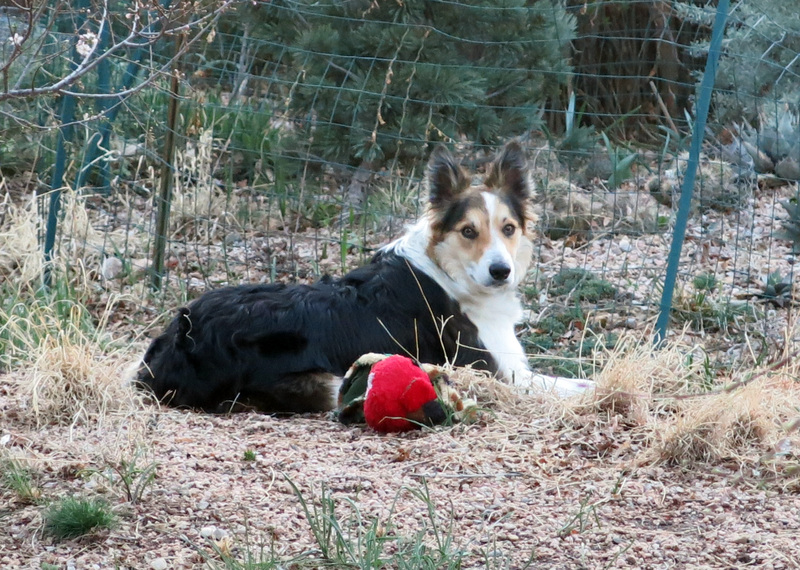 Here I am in a characteristically horticultural pose, with my favorite toy. You may recall that we had a blizzard a while back, like the post I mentioned said. I didn’t go to Day Care, and the guy I live with promised me two Day Care days in a row, which I got to have last week. I also got stuck with needles and poked at, at Thursday Day Care, and the doctor said I looked fabulous, and I guess I have to agree that I do. Of course he completely freaked out, since that would be the second highest snowfall in Denver’s recorded history, and very bad for the trees. So he said to show some garden pictures, before “everything gets wrecked”. 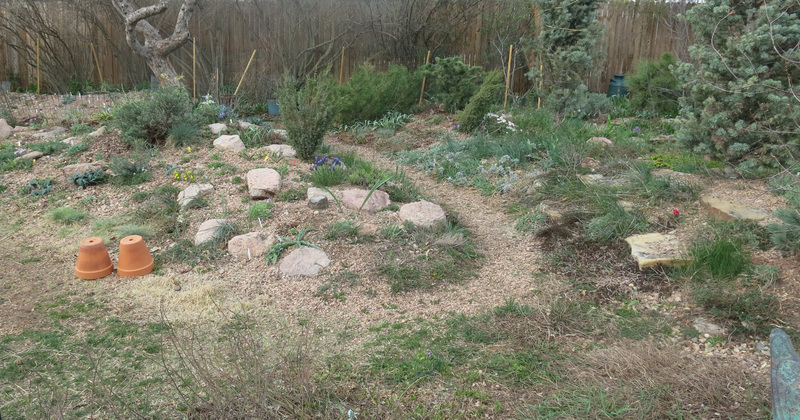 This is some of the rock garden, and you can see stuff is flowering. I think the flower pots were left over from when bulbs needed to be covered. A piece of duct tape was put over the holes in the pots. He could pick up the pots, and put them away, I suppose. The green grass in the lower left is not supposed to be there, but is. He didn’t dig it out like he thought he did, I guess. 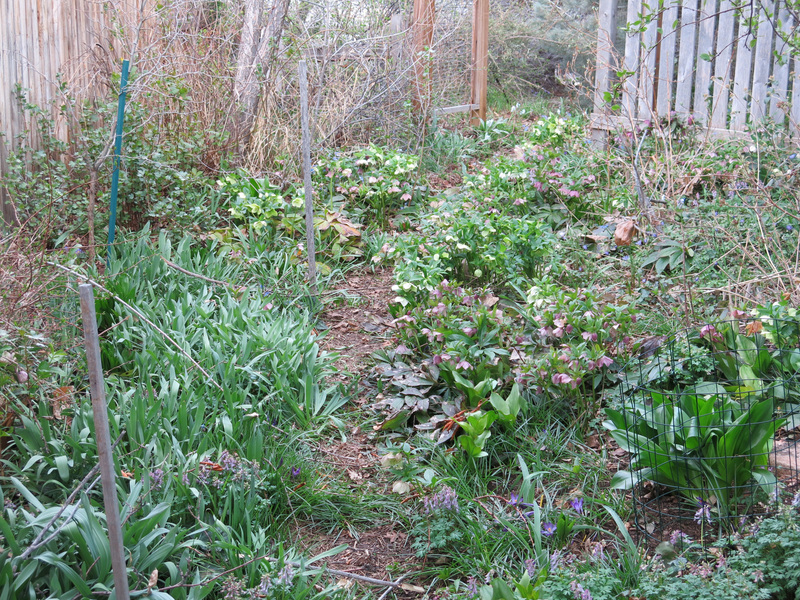 There are lots of hellebores flowering in the shade garden now. About a month later than usual. The lawn in the “way back” doesn’t look so good. The guy I live with blames me, running back and forth, on patrol. 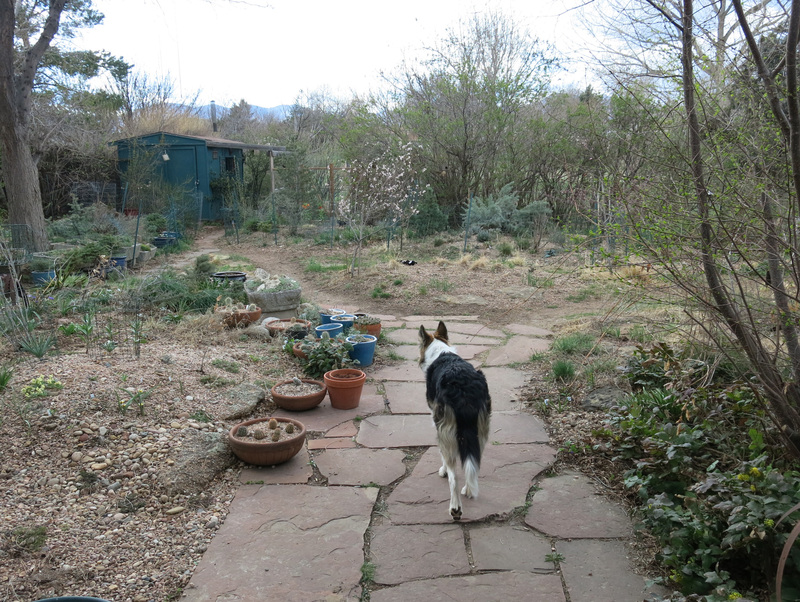 He says he’s going to dig up the buffalo grass there, and move it to the front of the yard, and sow “regular” grass seed, which will come back after I run on it all winter. (Maybe you remember when he took out the “regular” grass back here…..) You can see that the fence hasn’t been fixed yet either, like he said it would be. The part behind the apple tree, I mean. The birdbath cracked to pieces a couple of winters ago, and so only the stand, or maybe it’s a plinth, is still there. And hasn’t been removed, obviously. If you look closely you can see the little hill at the end of the path there. 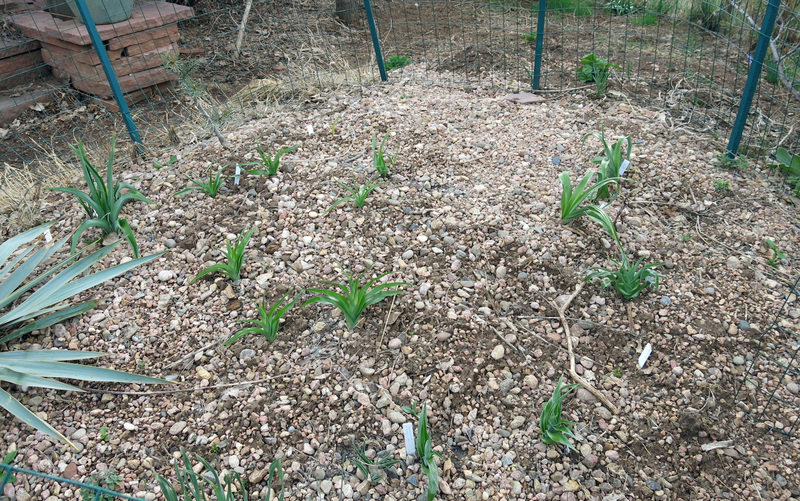 That’s where all the juno irises live. I wrote about them in “Day Of The Scorpiris.” They haven’t flowered yet, though the big one on the left, by the yucca, flowered last month. 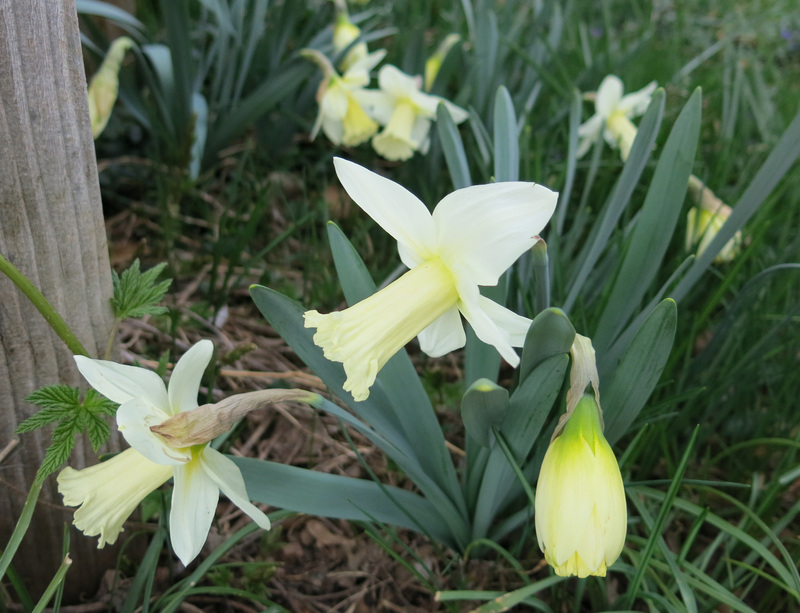 Around on the other side of the fence, the narcissus ‘Beersheba’, a favorite, is flowering. 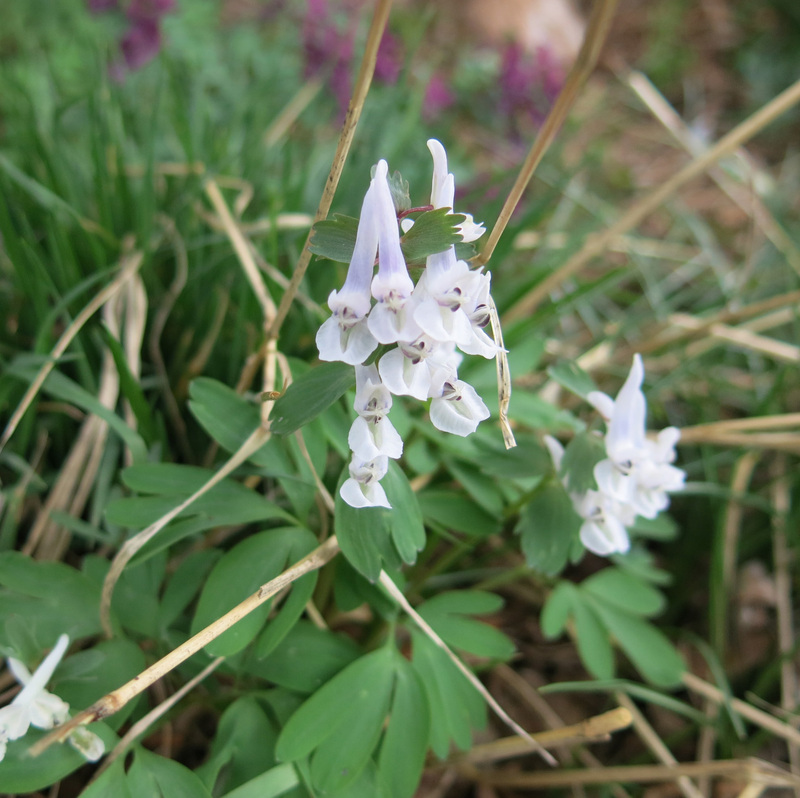 And there are bunches of selections of Corydalis solida flowering in the rock garden. On the shady rock garden, I should say. The guy I live with said I could have posted the names, but someone removed the labels. I wonder who he means. 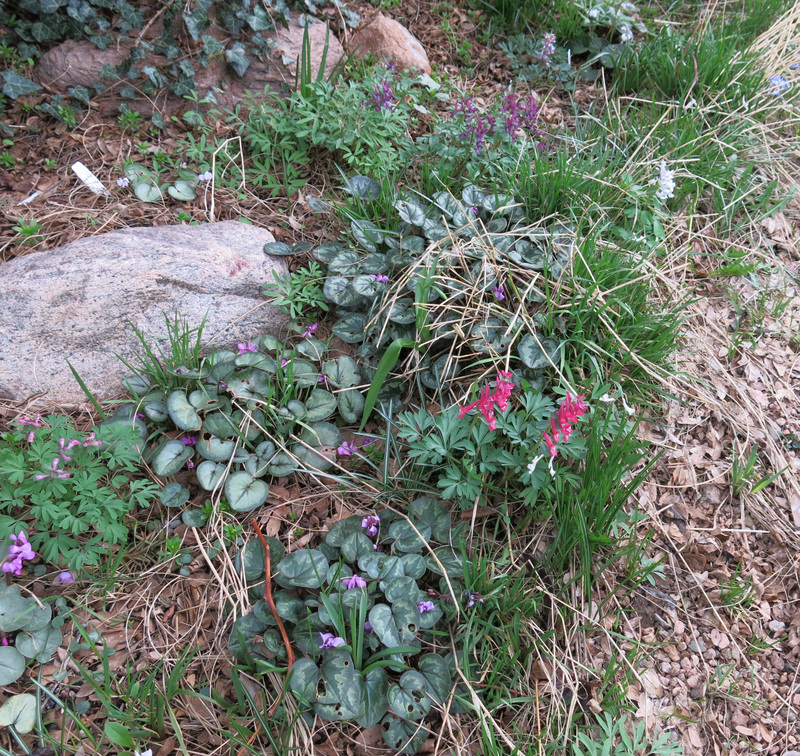 Lots of cyclamen, too, still flowering. This one does have a label. It says ‘Going Rouge’. 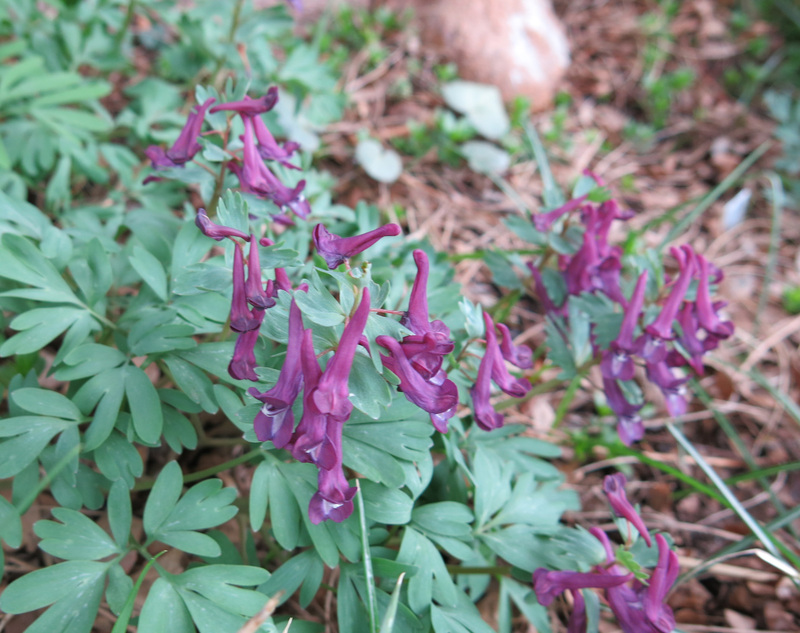 You can get these corydalis from Odyssey Bulbs, if you want. Well, I guess that’s it for now. I’m still fabulous. The guy I live with is super-mopey about the weather forecast, and says to say that if you don’t hear from us next week, it snowed, and we’ve moved to the Bahamas. It occurs to me Mani, after you mentioned the Guy You Live With moving the buffalo grass to the front yard, that I don’t actually don’t recall ever seeing photo of said front yard. I think we need a report from this area. I mean, the neighbors see the front yard so can it be that bad ? Well, what I meant was the front part of the back yard. Like where the green grass that shouldn’t be there was. I could probably show pictures of the front yard, though it’s all rabbity and stuff, and I’m only allowed out there on a leash, which is kind of insulting if you ask me, but the guy I live with says no way am I going out there otherwise, what with the huge pickup trucks that drive so fast in our neighborhood. There are oaks and stuff. And, like, the world’s tiniest front lawn, but that’s blue grama, not buffalo grass. “…. someone removed the labels.” Quite right too. A garden should be about plants, not labels everywhere. Labels where plants used to be (but died) is just pure laziness. We’re fairly lazy here, that’s for sure. At least one of us, anyway. Certain of you there are in it for the drama, it seems, and others maintain equanimity in the face of being stuck with needles and stuff. Or maybe it’s just dignity that’s maintained; goodness you look all dignified posed horticulturally with play toy. Drama, in the face of weather reports such as you have received, may be called for, as are all-out snits. 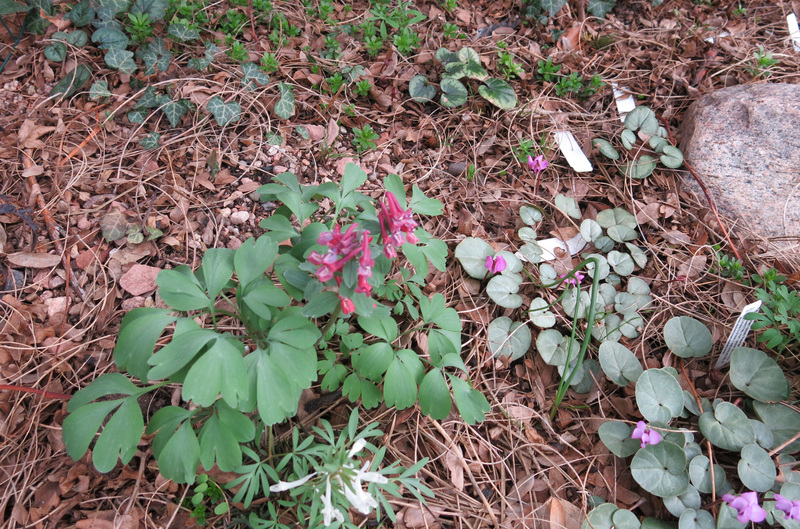 Your garden, Mani, *pre,* is quite beautiful with the mostly unnamed Corydalis solida and then the cyclamen. 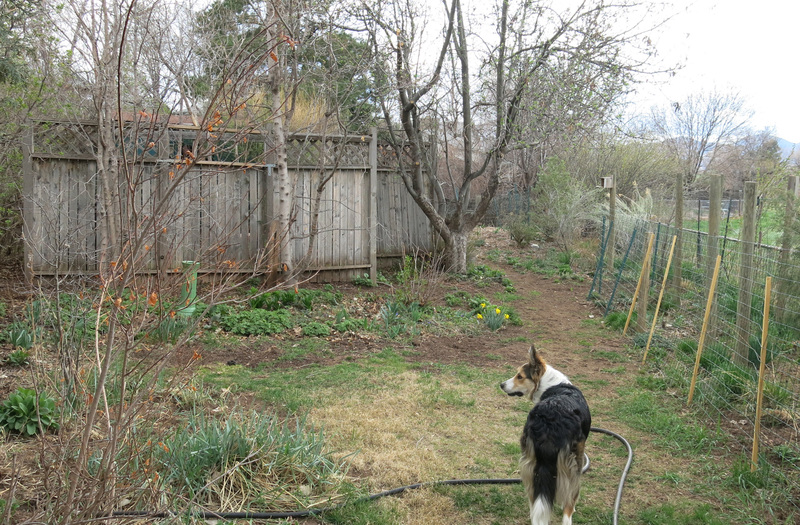 I look forward to seeing the backyard *post* too, with some super-mopey allowed. You can tell your guy you live with is a real gardener because what real gardener has not gone back and redone parts the way they used to be? Love the last shot of you, Mani, considering your path. Much garden excellence there. I too would like to see the oaks in the front yard. As for labels, I maintain an old glass cigar humidor on my desk for plant labels, those gone and those still with us. It’s a call on memory is what it is. 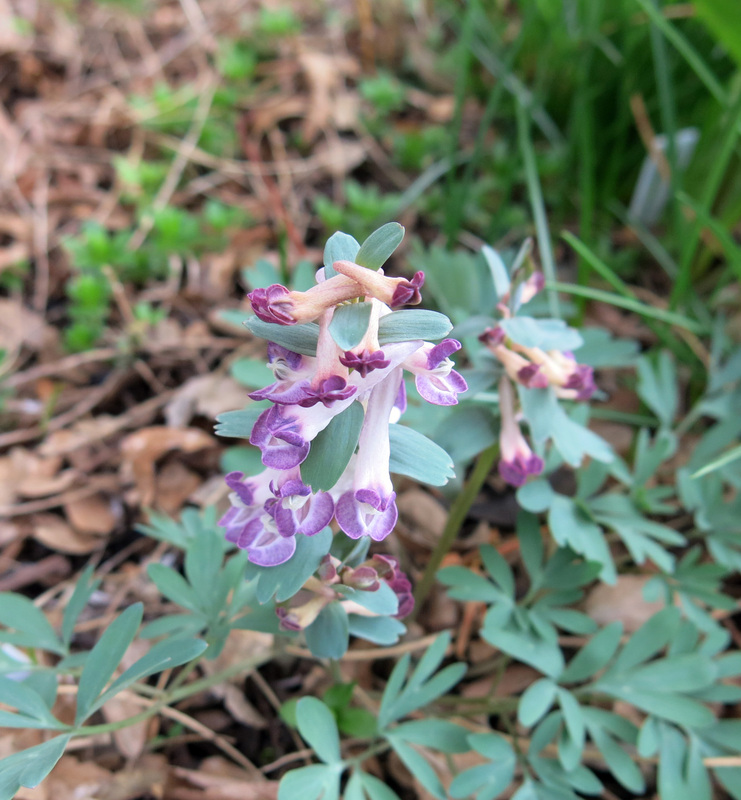 Hi Mani the faboulous, yet not extremely monstrously huge, purebred border collie, here too on the Maritime Alps the Corydalis (Corydalis cava (L.) Schweigg. & Körte) are in full bloom in their so beautiful colours pale yellow and pale purple. With of course many others plants. Spring everywhere in the valley is at its zenith. As our poet, Giacomo Leopardi, says: Primavera dintorno/ Brilla nell’aria, e per li campi esulta,/ Sì ch’a mirarla intenerisce il core. Or, if you prefer, Emily Dickinson: A little madness in the Spring/ Is wholesome even for the King,/ But God be with the Clown,/ Who ponders this tremendous scene / – This whole Experiment of Green – /As if it were his own! Greetings and salutations to you and to the guy-you-live-with from the Maritime Alps! Why thank you. Die Erde ist wie ein Kind, das Gedichte weiß; viele, o viele…… the guy I live with says he hopes this weekend will be nicer than predicted…..at least not too terribly scary. Mani Darling, this morning while I was driving unwilling and sulkily to perform “beautification ” in the city in which I teach, I heard a weather report for your state. Given that I live at least 800 miles from you, the aural appearance of a report on your weather on NPR struck me with foreboding. They tossed about terms like ” four feet of wet snow”. Now, I did get snowed on once, but my experience was limited to an inch and a half. I, therefore, have no useful advice to give, except for Bermuda is over-rated as a gardening destination. So, just stay strong, Mani, for the TGYLW, and huddle together for warmth and companionship. This too will pass. And the electricity and the Internet will come back and only the piles of snow to the north of the trees and bushes will remind you of what has passed. Please post when you can. Thanks. We have electricity and all that. They changed the forecast to a lot less snow. There’s only about four inches (ten centimeters) of snow here, at 8:34 p.m. It’s supposed to snow all night, though. It snowed just like this exactly a year ago, but I was too little to remember it. I did get to go on my walks, though they were shorter than usual, and there was a lot of complaining, but I also got to run around in the snow a lot, and then run upstairs and jump on the bed right after the bedlcothes came out of the dryer (they were really toasty), so, all in all, not a bad day. Anticipating snow when everything is in bloom must be tough. Wonderful pics though; the garden looks great (even if the grass is in the wrong place)! And Mani, you have grown to such a handsome beast! Thanks; I am pretty handsome, am I not? Modest, too. Yes, having a big pile of snow in the garden, and cold temperatures, when everyone else is having spring, is not a lot of fun, but we had spring, earlier, before a lot of other people did.